Rabies is a fatal viral encephalomyelitis which is prevalent in the developing countries of Asia, Latin America and Africa. Rabies manifests as either furious or dumb (paralytic) form. Dumb rabies manifests with acute onset of paraparesis simulating Guillain-Barre syndrome (GBS) or ascending myelitis. In these patients diagnosis is delayed as the characteristic hydrophobia may not be obvious and sometime these patients are intubated especially in Milwaukee protocol. In the English medical literature, there are only six reports (8 patients) of MRI changes in the patients with paralytic rabies [Table 1]. ,,,,, We report two patients with paralytic rabies highlighting the MRI findings and review the literature. A 44-year-old male noted rapidly progressive pure motor quadriparesis with bulbar and respiratory distress for 4 days and was referred to our hospital with a diagnosis of GBS. He had been bitten by a stray dog 1 month back for which he received single injection of anti-rabies chick embryo vaccine. At the time of admission, his pulse was 100/min, BP 160/100 mm of Hg, respiratory rate 32/min and temperature 37 o C. He was conscious and his mental functions were normal. There was mild IX th and X th cranial nerve palsy. The weakness was proximal and was more marked in the lower limbs (grade-3/5) than upper (grade-4/5) with mild hypotonia. Upper limb reflexes were normal but knee and ankle reflexes were absent with normal sensations. On the next day, he was restless with breathing difficulty requiring oxygen (4L/min) on venturi mask. He developed autonomic instability evidenced by perspiration, variability in heart rate (100-160/min) and blood pressure (130/80-190/100 mm of Hg). His blood gas analysis worsened further and he was mechanically ventilated. His white cell count was 15100/mm 3 , rest of the hematology and blood chemistry were normal. Cerebrospinal fluid analysis revealed 5 lymphocytes/mm 3 , with elevated protein (64 mg/dl). Serum for HIV was non-reactive. He was administered intravenous immunoglobulin G (IVIg) 400 mg/kg for 5 days but he worsened and his autonomic instability increased. He became progressively encephalopathic on 6 th day of illness and had a cardio-respiratory arrest on 16 th day. 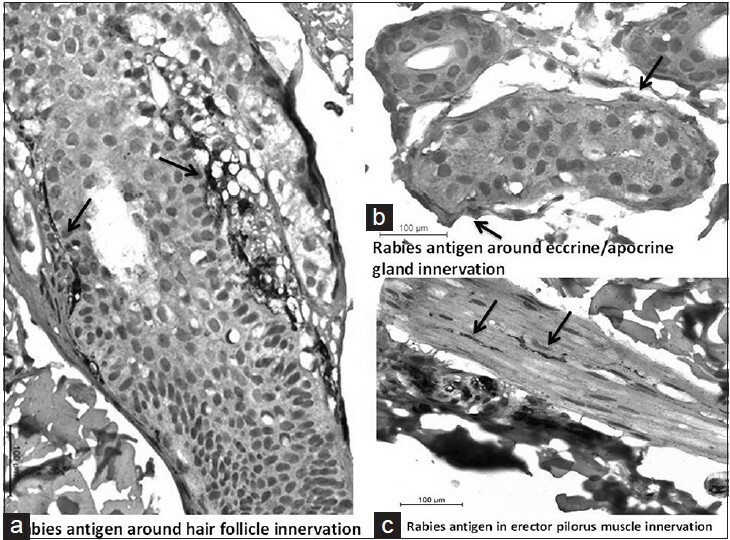 Post mortem skin biopsy from nape of neck on immune histochemsitry using antibodies to rabies viral nucleocapsid antigen revealed accumulation of rabies viral antigen within autonomic innervations of hair follicles and apocrine glands confirming the diagnosis of rabies [Figure 1]. A 14-year-old boy presented with history of fever 3 days back that subsided in one day. On the second day he developed rapidly progressive paraplegia with retention of urine. The patient was bitten by a street dog in the leg 1 month back and received four dosage of rabies chick embryo vaccine after 2 days of bite but did not receive rabies immunoglobulin. On admission, his BP was 100/70 mm Hg, pulse 110/min and was afebrile. His higher mental functions and cranial nerves were normal. He had flaccid are flexic paraplegia with loss of sensations below D4 spinal level. The possibility of acute transverse myelitis following rabies vaccine was considered and he was given methyl prednisolone 250 mg daily for 5 days. On the 2 nd day, he developed headache, irritability, high fever and diplopia. His spinal MRI revealed T2 and FLAIR hyper intensity in the spinal cord centrally extending from 1 st dorsal vertebra to conus medullaris. Cranial MRI revealed T2 and FLAIR hyper intensity in the hypothalamus, mid brain and pons posteriorly [Figure 2]. His blood investigations including serum electrolytes, liver and kidney function were normal. CSF revealed 54 mg/dl protein, 65 mg/dl sugar and 220 cells/mm 3 (65% polymorphs and 35% lymphocytes). HIV serology was negative. He developed respiratory distress on 5 th day of illness with worsening of blood gas parameters and had to be intubated and mechanically ventilated. On 6 th day of illness he had altered sensorium and developed loss of brainstem reflexes. He died on 7 th day of illness. His post mortem skin biopsy from the nape of neck was normal. Both our patients had dysautonomia evidenced by sweating, excessive nasotracheal secretion and wide variability of pulse and blood pressure. The autonomic dysfunction may be due to hypothalamic involvement. Rabies virus has been detected in extra-neural organs having autonomic innervation but centrifugal spread through autonomic nerve is unlikely. Both our patients received rabies vaccine after 48 hours of dog bite and anti-rabies immunoglobulin was not administered. Rabies virus spreads centripetally in the central nervous system at a speed of 12 hours for each synaptic step irrespective of distance. The diagnosis of dumb rabies is sometimes delayed because these patients do not have typical hydrophobia or aerophobia and alteration in sensorium appears in the terminal stage. Rabies antigen detection by real-time polymerase chain reaction (RT-PCR) in saliva, cerebrospinal fluid (CSF) and urine are less sensitive in the diagnosis of paralytic rabies compared to furious rabies but detection of viral RNA in hair follicles has high positivity (100% Vs 52%). Antibody assays are not very useful in the diagnosis as there is no primary viremia in rabies. Typical MRI findings may help in the diagnosis of rabies in the patients with ascending paralysis. We thank Mr. Rakesh Kumar Nigam and Mr. Deepak Kumar Anand for secretarial help. Willoughby RE Jr, Tieves KS, Hoffman GM, Ghanayem NS, Amlie-Lefond CM, Schwabe MJ, et al. Survival after treatment of rabies with induction of coma. N Engl J Med 2005;352:2508-14. Vaish AK, Jain N, Gupta LK, Verma SK. Atypical rabies with MRI findings: Clue to the diagnosis. BMJ Case Rep 2011;2011:pii. Solomon T, Marston D, Mallewa M, Felton T, Shaw S, Mc Elhinney LM, et al. Paralytic rabies after a two week holiday in India BMJ 2005;331:501-3. Mani J, Reddy BC, Borgohain R, Sitajayalakshmi S, Sundaram C, Mohandas S. Magnetic resonance imaging in rabies. Postgrad Med J 2003;79:352-4. Desai RV, Jain V, Singh P, Singhi S, Radotra BD. Radiculomyelitic rabies: Can MR imaging help? AJNR Am J Neuroradiol 2002;23:632-4. Hemachudha T, Ugolini G, Wacharapluesadee S, Sungkarat W, Shuangshoti S, Laothamatas J. Human rabies: Neuropathogenesis, diagnosis, and management. Lancet Neurol 2013;12:498-513. Wacharapluesadee S, Hemachudha T. Ante- and post-mortem diagnosis of rabies using nucleic acid-amplificationtests. Expert Rev Mol Diagn 2010;10:207-18. 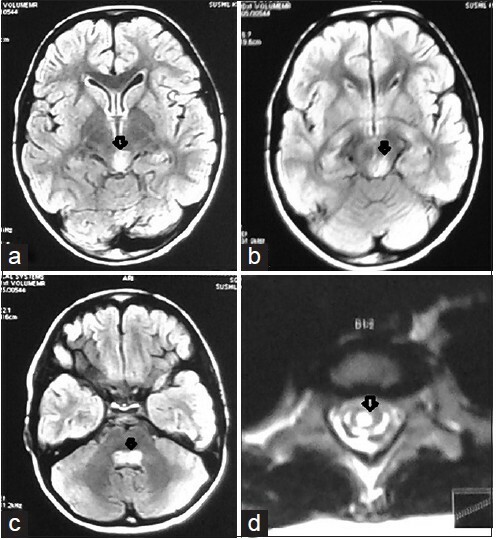 3 Magnetic resonance imaging in atypical rabies: time for clinical recommendations?